NOTE: Old post, a little brief. When I see a good movie I walk out feeling mentally, and even somewhat physically, revitalised. I sat in one of the very front rows of Reading’s Titan cinema for Marvel’s new Guardians of the Galaxy, and it gave me just that feeling. The one thing Guardians of the Galaxy has that other recent Marvel movies don’t have, besides being its own distinct movie that doesn’t get overshadowed in any way by other parts of the Marvel universe, is consistent energy. Yes, there were some amusing moments and fun scenes in all the recent Marvel movies I’ve seen. In The Avengers, in Captain America 2 and in Amazing Spiderman 2, but no Marvel movie that I can think of was ever this thoroughly energetic and thoroughly invested in itself. These are all original characters and due to that there’s really no heavy scrutiny with what’s done with them. They can be constantly goofy and fun without being of some damage to the integrity of their source materials in the ways adaptations like Michael Schumacher’s Batman movies were. The constant goofiness in the manner of pretty much every character in this movie, particularly John C. Reily’s character and in the dynamic and interactions of the somewhat socially crippled main characters, makes them more endearing and more original than other Marvel films, and creates a real emotional attachment when it reaches the climax and the movie requires you to be engaged with them. Not one of the actors are slouches at being the best characters they can be. In particular on and off WWE Superstar Batista (credited by his real name, ‘Dave Bautista’) as Drax stood out as a character I really felt an emotional connection to, and it’s really surprising to see a pro wrestler not only act so well but be used to the best of their potential to the great benefit of the movie they’re in. It had the same amazing visual effects as other recent Marvel movies except maybe a little more refreshingly distinct aesthetically, but what I really liked about what Guardians of the Galaxy did with it is that they didn’t force themselves to be totally convincing. The computer animation was often left looking obviously animated, almost cartoony. At the same time, it wasn’t particularly childish or cheap. It felt maturely handled and well and truly appeals to a mature audience. That certain feeling is something that needs to be aimed for more often with these movies. Guardians of the Galaxy also kept things pretty clean cut from a narrative standpoint. It didn’t try to be gritty, it simply invested you with an engaging narrative and rewarded your investment with a feel-good ending. Considering how it’s such a feat to tell a truly great mature story from a superhero movie, being fun is all I can reasonably ask for. All else I can say is go see it. 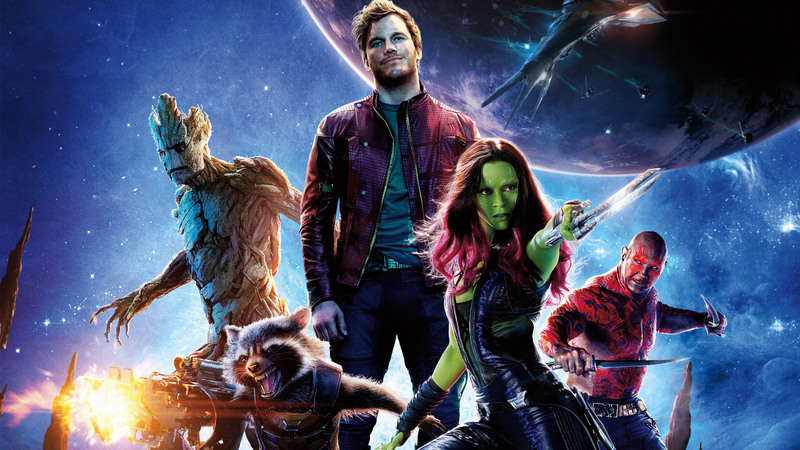 Guardians of the Galaxy is a great movie with fantastic simple characters and a fantastic simple story to tell, but more than that it’s just so truly genuinely endearingly fun. I grinned and grinned and grinned, and then I grinned some more on the way out, and I hope many others can share that sentiment with me.